Madison Curtis was diagnosed with Cerebellar Hypoplasia at the age of 9 months. She had had a seizure and a CAT Scan was done. Results showed a follow up MRI was needed. A few weeks later the MRI was done and she was then diagnosed with Cerebellar Hypoplasia. This is a rare disorder that affects the cerebellum. It can cause all around gross, fine motor and speech delays. When first diagnosed, Madison started speech, occupational, physical, feeding and developmental therapies once a week. She started rolling over around six months and sat up by herself around eleven months. Madison was always willing to keep trying and easy to work with. At about 19 months we were starting to look into groups on the web with similar diagnosis. That’s when we found out about the anatbanielmethod.com and set up our first lesson. At the Anat Baniel Method they teach the children’s brain new ways to connect. After just two lessons Madison started crawling! It was truly amazing. Madison started wearing eye patches and then eventually glasses. When she was 2 years old she had eye surgery to correct her cross-eye and her nstigmatism. She stills continues to wear glasses. Her speech has come a long way also. She still continues to get speech therapy in school. Doctors told Maddy that she may never talk or walk, she is sure proving them wrong. With this disorder it is hard to determine the outcome or timeline so it is a big wait and see. She continues to grow and achieve everyday. Madison is now 10 years old and in the fifth grade and in a mainstreamed class. This year she is without an aid and doing well. 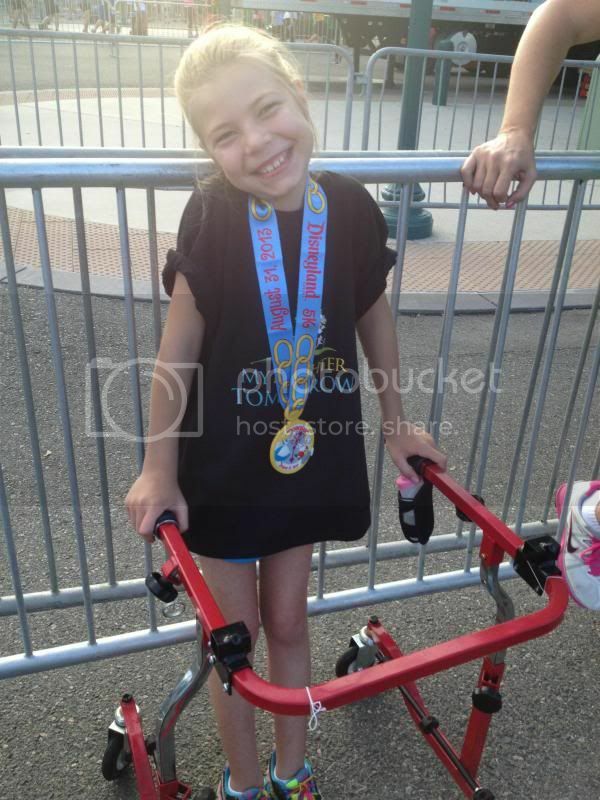 Maddy has participated in the Run Disney 5K the past two years. She uses a walker and is able to walk the length of a football field without assistance. Her will to never give up has kept her motivated to prove she is capable of anything. We can’t wait to see what she accomplishes next!